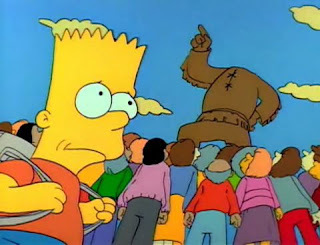 Or The One Where: Bart cuts off the head of the Jebediah Springfield statue. 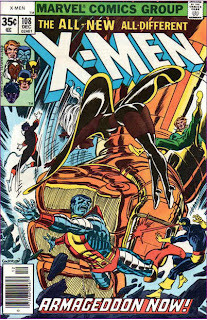 The Setup: On his way to see Space Mutants 4 ("the trilogy continues! "), Bart runs into Jimbo, Dolph and Kearney, the local hooligans, and decides to cut off the head of the town founder's statue so they'll think he's cool. A Work in Progress: Krusty the Clown, Sideshow Bob, Reverend Lovejoy, Apu and Jimbo, Dolph and Kearney all appear for the first time. The Simpsons attend church for the first time, in their typical fractured way, with Homer listening to a football game on Bart's Walkman. The story of frontiersman Jebediah Springfield, who once fought a bear with his bare hands and founded the town which bares his name, is told for the time. It will be expanded on (and questioned) in the season seven episode "Lisa the Iconoclast." This one of the few episodes to display the title onscreen. The Space Mutants, a horror film franchise in "The Simpsons" universe, appears for the first time. They are featured as the villains in the Simpsons video game for the NES. Also, the fact that Smithers' affection for Mr. Burns is something greater than employer/loyal yes man is suggested for the first time. Bart: Uh, ma'am? What if you're a really good person, but you get into a really, really bad fight and your leg gets gangrene and it has to be amputated. Will it be waiting for you in heaven? Sunday School Teacher: For the last time, Bart, yes! Sunday School Teacher: The ventriloquist goes to heaven, but the dummy doesn't. Bart: What about a robot with a human brain? Sunday School Teacher: I don't know! All these questions! Is a little blind faith too much to ask!?! Bart: But sneaking into movies is practically stealing, man. Bart: Well, okay. I just wanted to make sure we aren't deluding ourselves. Teebore's Take: A classic example of what "The Simpsons", especially in the early years, did very well: mix a standard sitcom premise (Bart learns a lesson about the importance of popularity) with a surreal plot (he learns this lesson by hacksawing off the head of a statue and incurring the wraith of an angry mob). Not incredibly funny, but watchable nonetheless. Amongst the funniest bits is the family's first act foray into church, both Homer's frantic following of the football game during the sermon and Bart peppering his Sunday school teacher with metaphysical questions regarding what does and does not earn a place in heaven. A host of major supporting characters appear for the first time, the myth of Jebediah Springfield is established, and the Homer/Bart lesson-learning all account for the high marks. Plus, this is the episode that gives us our "Classic" icon.